Just as when all seemed to be just an ordinary Thursday. 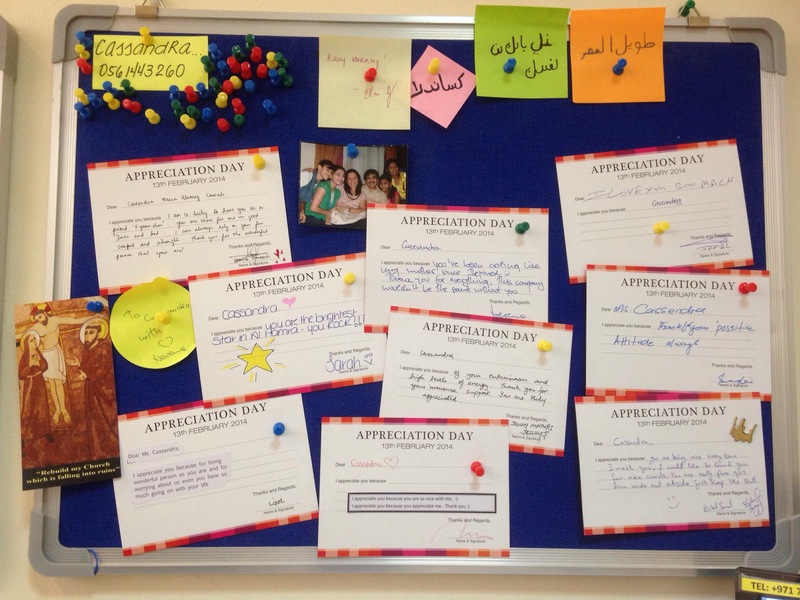 A typical, last working day of the week (for UAE) a heart warming activity was initiated by our company’s HR department. Always so dedicated in getting everybody within the company engaged with each other as colleagues and / or as friends. APPRECIATION DAY as the call it. It was a moment of surprise that even to simplest things you do everyday at work, someone is appreciating you as a whole. It was a moment of sharing what you feel towards the other. For so many years in my life, I have been celebrating Valentine’s day every 14th of February. But I never thought that 13th of February would be at any way better than the next day. At work we tend to feel lazy at times. We tend to lose our temper at certain situation. I guess it really is just a normal thing in the corporate world. But there is always something about you that is bound to be appreciated.